Coffee, My Voice and Babybottoms...Essentials To Your Day: I Love Cooking! One of my dreams of grandeur that are on their way to be being fulfilled is being able to do nothing but write all day...and cook at will. I LOVE TO COOK FOR OTHER PEOPLE WHO LOVE TO EAT!!!! I'm that cook who will slave in a kitchen all day (or night) and be simply content with the smiles that emanate from the people stuffing their faces. I grew up with a mother who was from Florida and a father from California. For some odd reason, my father's cooking always tasted like some Creole/Cajun food...spicy and full of flavor. My mom's food was the toned down version of my granny's but as time has passed, her food tastes JUST like Granny's! I was visiting my parents one day and I was shocked that my mom's food didn't taste like "mommy food" anymore...it tasted like that real deal Holyfield grandma food...probably because she IS a grandmother now, getting old and just don't care no more...as long as it tastes good. I vowed from about the age of 18 that if I was going to cook something, I was going to do my best for it to come out like that soulful grandma cooking. I had a boyfriend between the 18 and 21 years of my life that I used to cook for...he was my guinea pig but he loved it...and so did his raggedy friends who used to come and eat my damn leftovers when I'd go to work. I was cooking alright back then but it wasn't until I moved to Atlanta that I PERFECTED my skills. I had a LARGE concentration of guy friends when I first moved here and their favorite thing to tell me was "Females from California can't cook; all yall know how to do is be pretty. Go sit down somewhere and let the Southern belles do what it do in the kitchen". I was offended, to say the least, because some of the shat they praised from their Southern Belle homies tasted like straight box food...and it was. I come from a family that ONLY makes 7up Pound cake...from scratch. Macaroni and Cheese DID NOT have Velveeta in it...it was loaded with Cheddar (cause its betta), butter, and some other ingredient I had yet to figure out...AND IT WAS BAKED, not made in a damn pot and served. And greens...they weren't LOADED with sugar. So I stepped up to the plate and showed them that NOT ALL Cali girls fixate on appearance...some of us can cook too. I still didn't have that granny taste to my food...until I fell in love with the Food Network!!! Lord Jeebus!!!! That channel has been my saving grace several times!!! Because of that station, I have had the pleasure of stealing Gina and Pat Neely's recipes and creating magic in my kitchen! I don't follow ALL the directions though...I take what I think would enhance what I already know and make it my own. As a result of THAT....I made THE BEST turkey I've EVER tasted since my dad's friend slow roasted his turkey in the backyard with sausages stuffed all in it...I soaked that baby in this doctored up brine for 8 hours and then I rubbed it down in this BBQ rub...cooked it for 4 hours and it looked like I fried that bad boy! IT was the BEST part of my couple days off work during Thanksgiving! I made some greens, baked mac & cheese, and some dressing too. It was all delicious! I am in love with that blog!!!! Granted there is some stuff on there that I can only test drive on myself because all of my friends aren't that adventurous with their taste buds but I'm so excited to try them potatoes out!!!! I wish I could cook better. I'm on a quest to find one signature dish that I can perfect and it'll be known as mine. So far, no dice, haha! 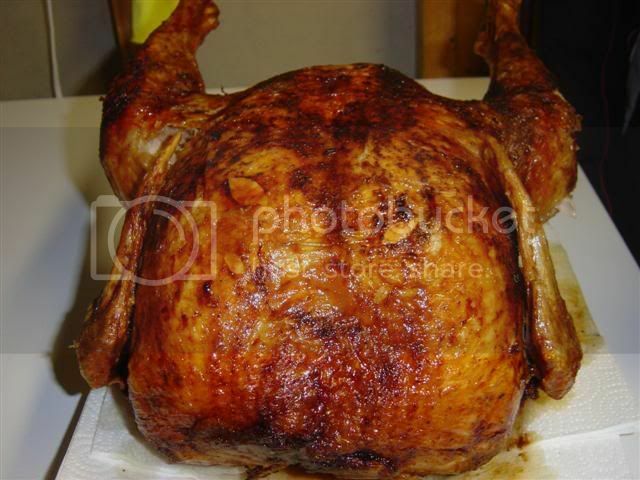 who puts the picture of the turkey they made on their blog? and yes Cali girls can cook. I wish I could cook. I have about 5 dishes that I know how to make lol... thats so sad. I guess I need to invest in some cookbooks or wactch a few food network shows. and dang that turkey looks good. I don't even like turkey to eat it more than a few times a year but if I had that one....yeah it would be over lol. It irritates me to no end when people say females from Cali can't cook. Hello! Most women from Cali were raised by women from the South..or have a grandma from the south. Of course that ish will most likely be handed down. Anywho, I can cook but I have no desire to cook for myself on a daily basis. I do believe that once I get a man and some kids, that desire will change and I will be inspired to cook 2-3 times a week. Those other 4 days, they're on their own. I do great with side dishes and vegetables (macaroni & cheese, dirty rice, mashed potatoes, stuffed mushrooms, spinach) and I do well with chicken (fried and baked, but what Black woman doesn't? lol) and can hook a salmon up and my cornbread is delish, but that's about it. Oh and I'm good with the few cakes I was forced to learn how to make as a teenager. My dad used to make requests for ham sandwiches everyday after he got off work. I made them like the sandwiches at the deli and I think that's why he LOVED them so much. aww man, i love food!! words can not explain, at times i like to cook, but not more than i can eat!